Dr. Vivek Kumar is an exceptionally trained General and Interventional Cardiologist. He received his medical degree at the Lake Erie College of Osteopathic Medicine in Erie, PA. He completed his Internal Medicine Residency at the Western Pennsylvania Hospital in Pittsburgh PA, fellowship in Cardiovascular Diseases at the University of Pittsburgh, followed by fellowship in Interventional Cardiology at the Western Pennsylvania Hospital. Dr. Kumar is Board Certified in Internal Medicine, General Cardiology, Interventional Cardiology, and Nuclear Cardiology. He is a Fellow of the American College of Cardiology and as a Fellow of the Society of Cardiac Angiography and Interventions. In addition, he sits on the Pulmonary Arterial Hypertension Advisory board for Gilead Pharmaceuticals. His fields of expertise include high-risk coronary intervention, chronic total occlusion coronary intervention, peripheral vascular interventions, pulmonary hypertension and pacemaker implantation. Prior to relocating to the Sarasota / Bradenton Florida area, Dr. Kumar served as the Medical Director of the Cardiac Catheterization Laboratory at UPMC Mercy in Pittsburgh, PA from 2005- 2006 and 2009-2016, the Section Chair of Cardiology at the Butler Memorial Hospital in Butler, PA from 2015-2016. He now practices General and Interventional Cardiology at HeartCare in Lakewood Ranch, FL. 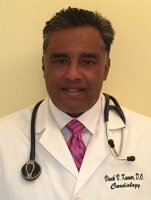 Dr. Kumar has presented multiple lectures to varying audiences over his 16 years of Cardiology practice, and served as Co-Director of a Peripheral Vascular Intervention Course in 2006 through the Mercy Hospital of Pittsburgh. Prior to his medical career, he was elected Most Valuable Player twice and Co-Captain of the University of Pittsburgh Varsity Tennis Team. Dr. Kumar participated in multiple Pro-Am tournaments and played and taught tennis professionally. He is also a certified tennis teaching professional from the USPTR and held regional rankings in the Middle States Tennis Association. He is married and has two children. He and his whole family are avid golfers. Faith and Alyssa were awesome today. Took a lot of time with me. I like my new doctor. Wonderful, knowledgeable doctor. I'm happy to found him. Dr. Kumar is wonderful. I have issues with my heart and Dr. Kumar has solved all of them and monitors my heart to insure everything continues to be. He is a fabulous diagnostician and extremely knowledgeable. Wonderful staff and providers. Excellent Experience. Dr. Kumar was very kind, Thorough patient and knowledgeable. Dr. Kumar is a highly skilled doctor with impressive medical expertise and training. Dr. Kumar is very thorough, listen to concerns and prescribes appropriate treatment. I highly recommend Dr. Kumar. I have absolutely loved your office. Everyone is so friendly and knowledgeable. I feel so welcomed every time I have a visit. I appreciate everything your clinic has done for me. Doctor is patient and takes time to listen and understand. Does not rush through appointment. Dr. Kumar was very kind, thorough, patient and knowledgeable. Dr. Kumar is a highly skilled doctor with impressive medical expertise and training. Dr. Kumar is very thorough, listens to concerns and prescribes/ appropriate treatments. I highly recommend Dr. Kumar. Wonderful staff and provider. Excellent experience. Alyssa and Dr. Kumar were incredible! Dr. Kumar was thorough, competent and possessor the ability to address my concerns in a compassionate manner. Can't say enough about Dr. Kumar and his professionalism and friendliness. I thank God that he's my cardiologist. Staff is wonderful too! Nurse who calls about INR results is super! Great office! Dr. Kumar is an excellent physician who shows great compassion for his patients! Super care, super doctor and great staff. Every one in this office is very professional, caring and extremely competent. Super service. Doctor is easy to talk to and understand. We were referred to Dr. Kumar by our doctor in PA so thankful we were. There was not a flaw. We got an appointment with ease. The office staff personable and kind. Dr. Kumar was everything we needed him to be. Bright, knowledgeable, patient, willing to listen, willing to take time to explain what we needed to know. Exactly what the doctor ordered! From start to finish a good experience. This office is amazing! Always answers the phone. Kind courteous. Dr. Kumar has excellent bed side manner all staff and doctors are fantastic! Always impressed with office staff! Dr. Kumar was easy to talk to. He listen attentively and explains medical condition and assesses patient. Great office, great staff, Excellent doctor! Great man! Caring and sweet! Very thorough exam, spends extra time listening and close exam. Excellent service and professional friendly manner helped us understand what was going on with condition. I was very impressed. Kumar is great. I am very happy with the way Dr. Kumar explained and listened to my condition. I wish to see him on all visits if possible. I wish all doctors were as thorough as he is and had his bedside manner! We've been extremely happy with Dr. Kumar and the entire staff at the office.